Are you a wine lover? This one’s for you! A Fanciful Notion have launched their Whimsy and Quiet Revolution wines, with an event held at The Black Addition in Kent Town. The launch featured nibbles from local suppliers, against a backdrop of paintings from young, South Australian artists. Brand founders Tricia and Tanya have a real love for South Australia, and the launch was a vibrant reflection of that. The Whimsy label currently has two varieties, a 2015 Sangiovese and 2016 Pinot Noir. The Sangiovese appears delicate, but surprises you with spice and kick. A contradiction which A Fanciful Notion believe reflects our complex world. The Pinot Noir, an award-winning Adelaide Hills pick, is also complex. Smooth and medium bodied, it has woody undertones with a note of cherry. Tricia and Tanya enjoy a good Pinot Noir, and believe it is often done well in the Adelaide Hills. Each Whimsy wine makes up part of a story; these are part of Truth in Ink. Truth in Ink is an opportunity to explore tattoo art and for the community to share their passion. Tattoo enthusiast Steve Barry features on the Pinot Noir. He’s an illustrator by day and DJ by night. At the launch, I see Steve: bearded, pierced and tattooed. Yet, striking up a conversation, I found a friendly, art-appreciative man – the cherry in a woody pinot noir. If you need a reason to feel good about drinking wine, then Quiet Revolution is for you! 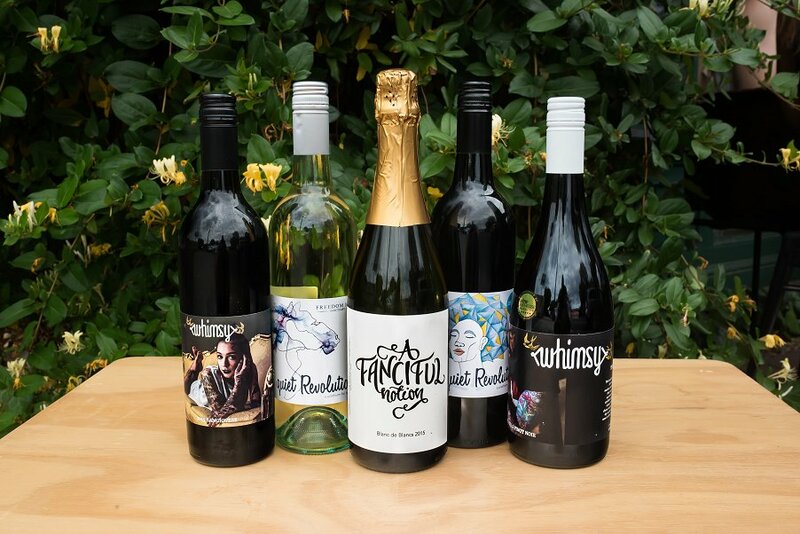 The label produces vegan wines from South Australian suppliers, while also supporting local artists and charities. A percentage of profits go into the charities. However, Trisha and Tanya also support the organisations in other ways. They look for smaller charities, who might not have the marketing resources of their larger counterparts. Quiet Revolution makes a point of including the charities information on the bottle, to educate consumers. ‘People might just become aware of the smaller charities around South Australia,’ she smiles. Quiet Revolution currently has a red and white variety. The Red is a polished blend of Cabernet Sauvignon, Shiraz, Merlot and Mourvedre from McLaren Vale. It has hints of black pepper, berries, smoked plum and dark fruit. Overall, incredibly smooth with a strong finish. The Red supports Harvest Fair, a meal delivery service focused on advancing gender equality in Australia. They offer flexible employment and opportunities to develop skills to create equitable employment. The White is also a McLaren Vale pick – this time a Chenin Blanc. Trisha and Tanya chose this wine because it is incredibly drinkable, Trisha says. She calls it ‘the wine you can take anywhere’. The White does indeed prove to be incredibly fruity. There are accents of apples, pears, peaches and lemon. It’s as crisp as the fruit. The nibbles themselves were a delightful mix of inventive foods, including vegan options. The cherry tomato, basil and vegan cheese skewers were a standout. The vegan cheese was constructed of turmeric and black pepper. It was incredibly melt-in-your-mouth, rich and with the faintest spice. 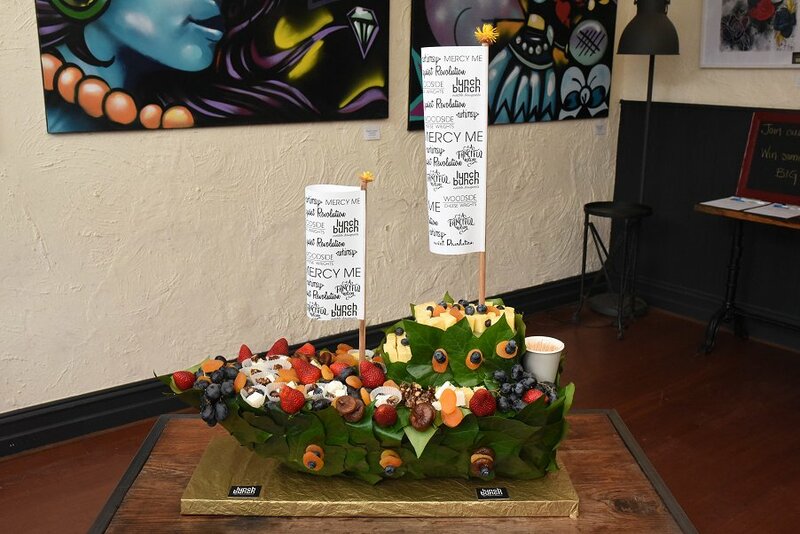 Lunch Bunch provided a boat-shaped platter that easily stole the day – or should I say sailed away with it! Local brand Woodside Cheese Wrights was featured, alongside a variety of fresh and dried fruits. The boat was gorgeous to look at, and more delightful to eat. Colourful beetroot, hummus and pumpkin seed toast also tied into the arty theme, mixing colours and flavours in an entirely new way. The launch signed off with some delightful chocolate truffles. The wines mixed well with chocolate and proved their versatility. Overall, this company is committed to South Australia, and committed to creating delicious wines. Give A Fanciful Notion a try, and remember you’re supporting South Australia while you’re doing it!